Those of you who know me well, know that I CANNOT start my day without caffeine. I just got the bad boy above from La Muerta, my purchase motivated by the notion that this is what I look like before I’ve had my morning joe. Based out of San Diego, La Muerta is a freak show that gives some of the best apparel artists from around the world the freedom to create whatever the hell they want. They are one of those grateful brands that take the time to send a handwritten “thank you” note with each order. If you like what you see, be sure to sign up for their newsletter. They send out a discount code with news of each upcoming release, and if you visit them on Facebook right now, they’re offering 20% off everything. 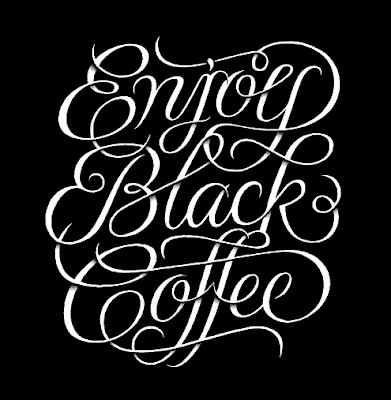 For something a little more elegant, the blog “Dear Coffee I Love You” brewed up “Enjoy Black Coffee”. The hand drawn type really is beautiful. It’s also available as a zip-up hoodie. “Dear Coffee I Love You” is a great reference for the coffee aficionado, featuring coffee and product reviews, tons of educational info, gift guides, and accounts of visits to coffee shops around the globe.